NEVER give children realistic looking toy guns or let them to play with such toys. If your child has toy guns you may want to use them to demonstrate safe gun handling and explain how they differ from genuine guns. There should be no chance that a child could mistake a real gun for a toy. 1. Point the gun in a safe direction. 3. Keep it unloaded until ready to use. Gun safety is largely common sense. If one treats every gun as if they are loaded (loaded or not) you will naturally keep the barrel pointed in a safe direction and keep your finger off the trigger (until ready to shoot), which are the key safety measures that need to be ingrained in every person who uses or handles a gun. 1. Know the target and what is beyond. 2. Know how to use the gun safely. 3. Be sure the gun is safe to operate. 4. Use the right ammunition for the gun. 5. Use eye and ear protection. 6. Don't use alcohol or any drugs. 7. Know that extra safety measures may be needed in some situations. 8. Unload and clean guns after use. Store all guns in a locked gun safe. If not stored for security use a gun should be unloaded with the ammunition locked up separately in a locked steel box (e.g., a petty cash box). Guns should be unloaded and fitted with a trigger lock when transported unless carried for security use. If a handgun is carried for security use it should be in a secure holster with at least two built-in retention devices to prevent it falling out of the holster or being snatched (e.g., a Safariland SSII security holster). NRA's gun safety rules for young children and gun users. The GunProof website is dedicated to helping gun proof children. There are hundreds of millions of guns around the world, some of which are not safely secured, while many older children are able to overcome any safety mechanism given time. Just as it is impossible to childproof swimming pools, rivers and oceans, it is impossible to childproof guns. There is no ethical alternative but to teach children gun safety and (when older) how to safely handle guns in order to help protect them. It would be irresponsible to simply tell all children that water and guns are dangerous and not to go near them. As children grow older and more independent they must be provided with more information, or their default water and gun safety education will be acquired via the media (fun looking but often dangerous behavior). Children must be taught water safety, how to swim, gun safety, and how to safely handle a gun. Water safety and swimming lessons are taught to most children around the world as it would be irresponsible not to do so. Likewise, it would be irresponsible not to teach gun safety to young children and gun handling skills to older children (by age 10) even where most guns are banned, as there will still be guns in the hands of occupational users and criminals. If an older child expresses an interest in guns the responsible thing to do is get them into a target air rifle club where they will learn how to responsibly use guns in a safe environment. 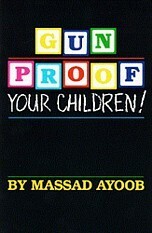 Gunproof Your Children - the best book about gun proofing children. 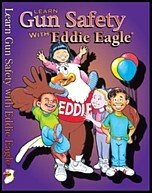 Eddie Eagle GunSafe® Program - the best gun safety program for schools.